That reason? Katie Lowes who plays Quinn Perkins in the show. For nearly 20 years, our families have shared a ski house in Vermont. So every Thursday I look forward to getting to see Katie in our living room. On Valentine’s Day I was lucky enough to see her again when she appeared (as herself) on the ABC talk show The Chew. And she was so stinkin’ adorable! You can watch the clip here. It just so happens that during Katie’s bit on The Chew they made a delicious looking (and crazy healthy) meal that I knew I had to recreate ASAP. I’m always looking for new ways to cook salmon and what could be better than a) slow roasting and b) topping it with an insanely tasty avocado salad? With slow roasting, you cook the salmon at a very low temperature (225 degrees) for a bit of time (about 40 minutes). It cooks all the way through and stays totally moist (ugh I hate the word, but couldn’t think of a better way to describe it.) Bonus: It doesn’t stink up your apartment! Then there’s the avocado salad: creamy chunks of avocado, orange zest and juice, diced shallot, spicy freshno chili, and spunky champagne vinegar. I mean really. It doesn’t get much better than this! Preheat oven to 225 degrees. Place salmon on silpat or parchment-lined baking sheet. Drizzle olive oil, season with salt and pepper. Cook 35-40 minutes until cooked through. Meanwhile, prepare the avocado salad. Place ingredients (avocados through chili) in a bowl and mix to combine. Cut salmon into 4 equal-sized pieces. 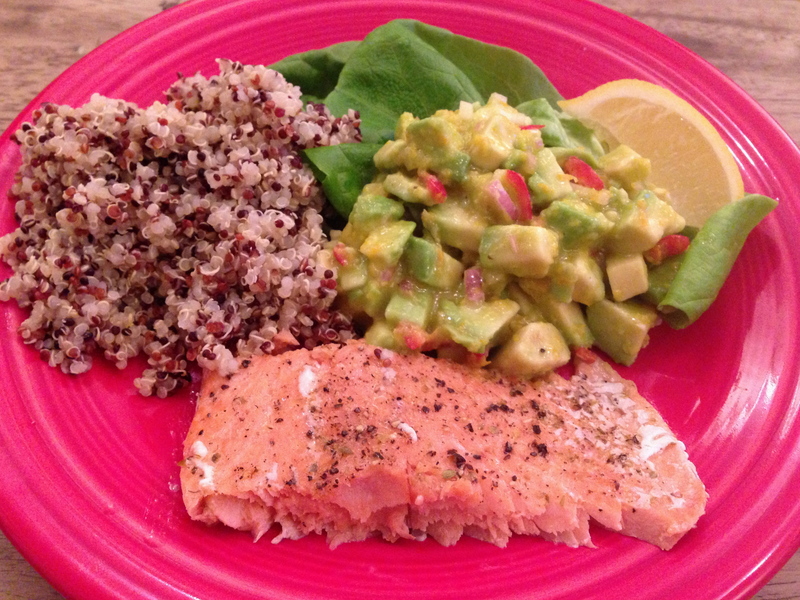 Top each piece with avocado salad and serve with quinoa if desired. This entry was posted in Fish on March 5, 2013 by Paige Greenfield. Are you in need of a quick weeknight meal that’s short on time, but full on flavor? I’ve got your solution right here. 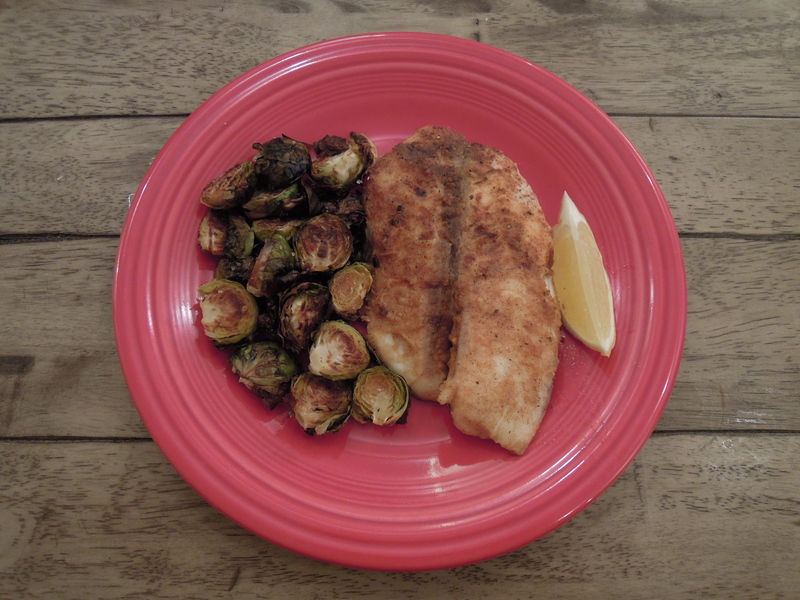 This tilapia recipe will knock the socks off of everyone in your household. I’ve found that keeping a go-to tilapia recipe up my sleeve is a great way to avoid hitting up our local Chipotle, sushi joint, or Chinese take-out on those nights when I’m not quite sure what to make. 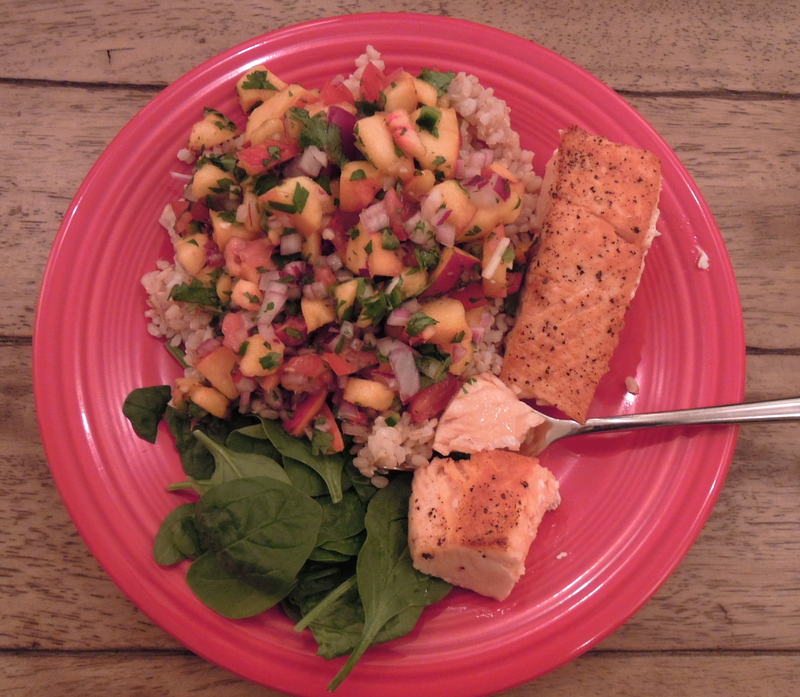 I was able to throw this meal together using some frozen tilapia (soooo budget friendly!) and extra Brussels sprouts. Because apparently I’m the kind of person who has extra Brussels sprouts. I’ve been making a version of this tilapia recipe for a while, but it recently occurred to me to add a few additional spices (paprika and cayenne) to the dredging mixture and it launched things into a whole other tasty dimension. Although the recipe uses very little flour over all, it gives the filets a slightly crispy outer layer that completely transforms an otherwise unexciting variety of fish. Because let’s face it, tilapia isn’t the fanciest fish you can buy. But with this recipe, no one would know. The result, as my Grandma Fanny would probably say (cue thick New York accent): It’s a nice piece of fish. Combine flour, paprika, salt, pepper, and cayenne on a plate. Mix with a fork or small whisk. Pat tilapia dry with a paper towel. Lightly brush fish with olive oil on both sides. Dredge both sides of the fish in flour mixture. Place fish in skillet. Cook about four minutes on each side until fish is cooked through. This entry was posted in Fish on January 14, 2013 by Paige Greenfield. Do you have a go-to healthy meal? The thing you make on Monday after you’ve been stuffing your face with all kinds of good stuff for days on end? I do. It’s almost always salmon. Salmon, something green (usually steamed kale), and another veggie (roasted tomatoes in the summer, baked sweet potato in the winter.) It’s just an easy, satisfying, completely whole food, no-doubt-about-it good for you meal. I hope you don’t mind if I take just a moment here to indulge in a little food rant. A good kind of rant. A kind of rant that you’ll thank me for later. You see, spaghetti squash isn’t a substitute for pasta. It’s just not. In my search, I saw tons of recipes online that sub the squash in for the wheat-based stuff. From experience, I just want you to know that no matter how much you try to convince yourself of it, squash will never be spaghetti. Not even spaghetti squash. I’m just looking out for you because I don’t want you to be disappointed. Yes it’s thin and noodle-like in appearance, but that’s where the similarities end. Spaghetti squash has just the slightest bit of crunch and an earthy squashy flavor. It’s really delicious, I promise, but if you what you really, really, really, really want is spaghetti have spaghetti. And when you want squash, well, eat this! Moral of the story: if you take spaghetti squash for what it is–and this recipe is a great introduction to cooking with it– I think you’ll be totally delighted. Preheat oven to 375 degrees. Halve the squash lengthwise. Season the cut side with salt and pepper. Place squash cut side down in a 9×13 glass baking dish. Add 3/4 cup of water. Cook about 45 minutes until tender when poked with a fork. After the squash has been cooking for about 20 minutes, place tomatoes on a rimmed baking sheet, drizzle lightly with olive oil, season with salt and pepper and roast for about 25 minutes. When the squash has 10 minutes left, place the shrimp on a rimmed baking sheet, drizzle with olive oil, season with salt and pepper, and roast for about 10 minutes until pink. After you remove squash from oven allow it to cool so you can hold it. Once the squash is cool, scoop out the seeds and discard. Using a fork, scrape the flesh of the squash into a bowl. 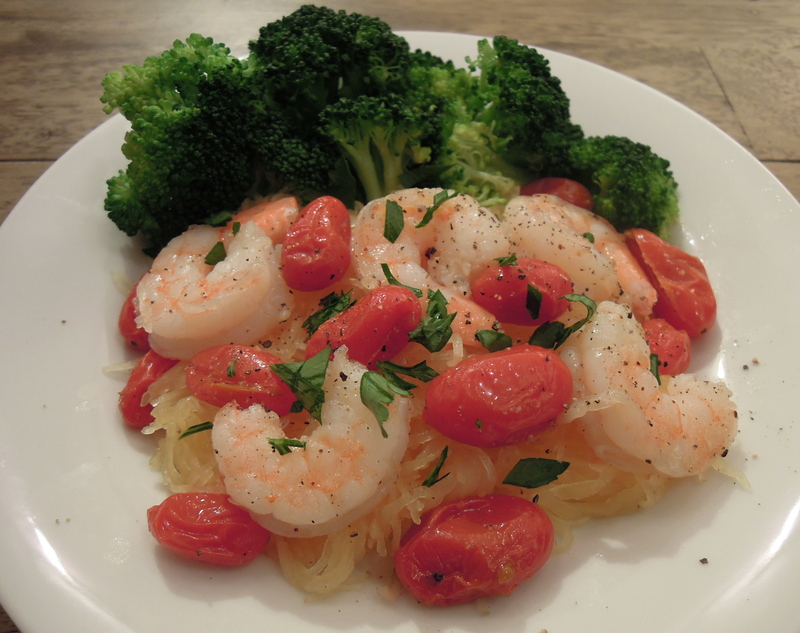 Add shrimp, tomatoes, and broccoli to the bowl. Squeeze about 1 Tbsp fresh lemon juice, season with salt and pepper if needed to taste, add parsley, toss to combine and serve. 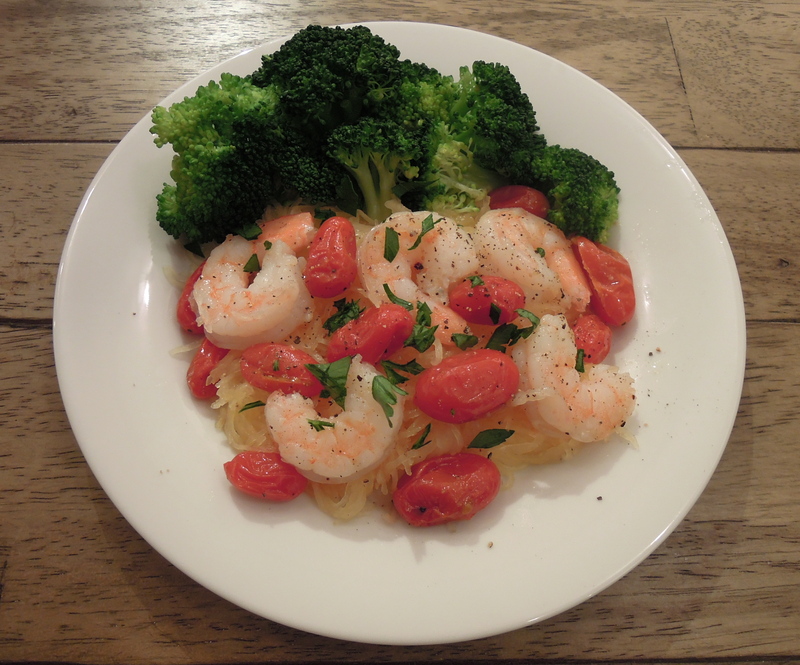 This entry was posted in Fish, Vegetables on September 21, 2012 by Paige Greenfield. Do you ever have one of those weeks? One of those weeks where, for absolutely no reason at all, you seem to dwell more in your head than in your heart? 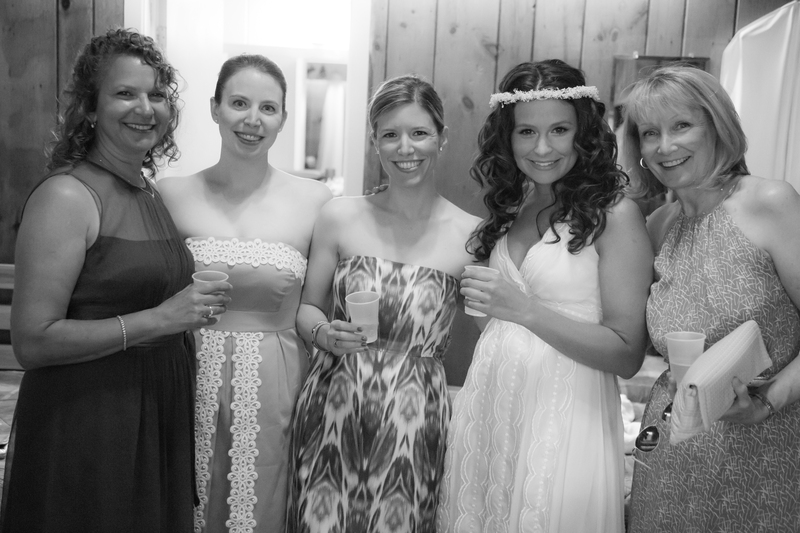 I try to do everything I can to keep those weeks to a minimum, but last week….last week was one of those weeks. The thing I’ve learned about those weeks is you’re the only person on the planet who can bring yourself back into balance. So you have to dig deep into your arsenal of those things that make you feel like you even if it means reaching for every single tool you have. Eventually one will do the trick. See that dinner above? That’s the one that did the trick. Although it was totally delicious that was just a bonus. A side effect of my pleasure. What truly did the trick was cutting the pineapple into tiny pieces, squeezing the last bit of juice from the perfect little limes, experimenting with simmering brown jasmine rice in coconut milk (a creamy, tropical-tasting success! ), and getting lost in the stories of country crooners pouring from the speakers throughout our apartment. I don’t know why and I don’t know how it worked. I just know that by the time I sat down to dinner it just did. My heart felt a little lighter. The room seemed a little brighter. And everything tasted a little sweeter. To make the pineapple salsa, combine ingredients pineapple through salt in a bowl. Mix with a spoon. Set aside. For the fish, heat a pan on medium heat. Pat tilapia filets dry with a paper towel, brush one side of each filet with olive oil, sprinkle with seasoning. When pan is hot, place fish in pan seasoned side down. Brush the other side with olive oil and sprinkle with seasoning. Cook two to three minutes, flip, and cook two to three minutes on the other side until fish is cooked through and flakes easily. 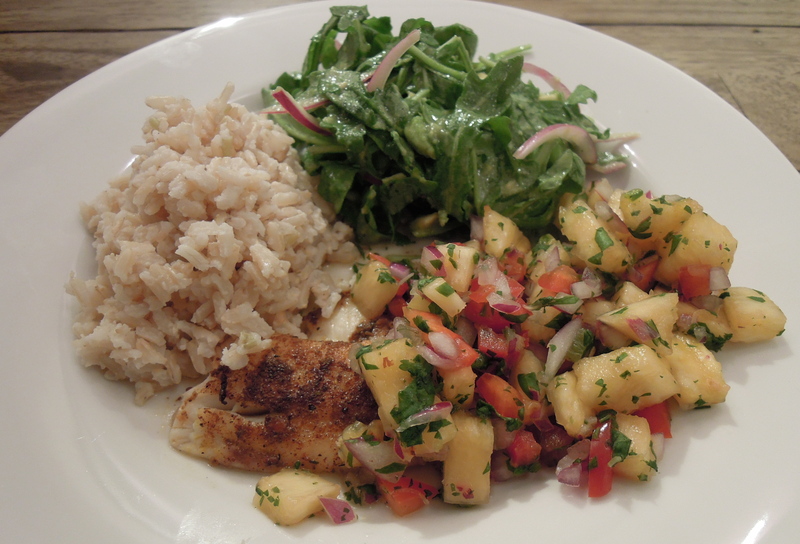 Serve with pineapple salsa. Combine rice, coconut milk, and water in a pot. Bring to a boil. Stir, cover, and simmer for about 40 minutes until liquid is absorbed. This entry was posted in Fish, Sides on September 9, 2012 by Paige Greenfield. Walk into any farmers market, produce store, or supermarket and it quickly becomes clear that stone fruit–especially peaches–are having a moment. Last weekend we stocked up at a farm stand on our way home from a trip to Michigan and this weekend we bought about a dozen softball-sized peaches at the Green City Market here in Chicago. Even before unloading our bags I knew that some of our bounty was destined to become peach salsa. But this isn’t about mangos in the winter, it’s about fresh, juicy peaches in the summer! Is there anything more perfect? Just keeping it real around here. 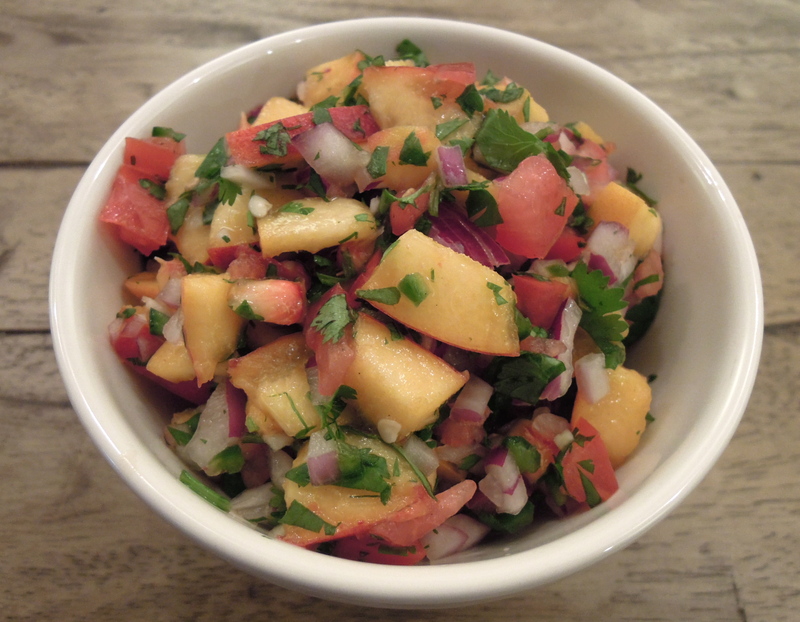 Of course, you can serve the peach salsa countless different ways–on top of chicken, shrimp, tacos, or scooped up in a crispy tortilla chip. In other words, what are you waiting for? Combine all ingredients in a bowl. Taste and adjust any quantities as desired. 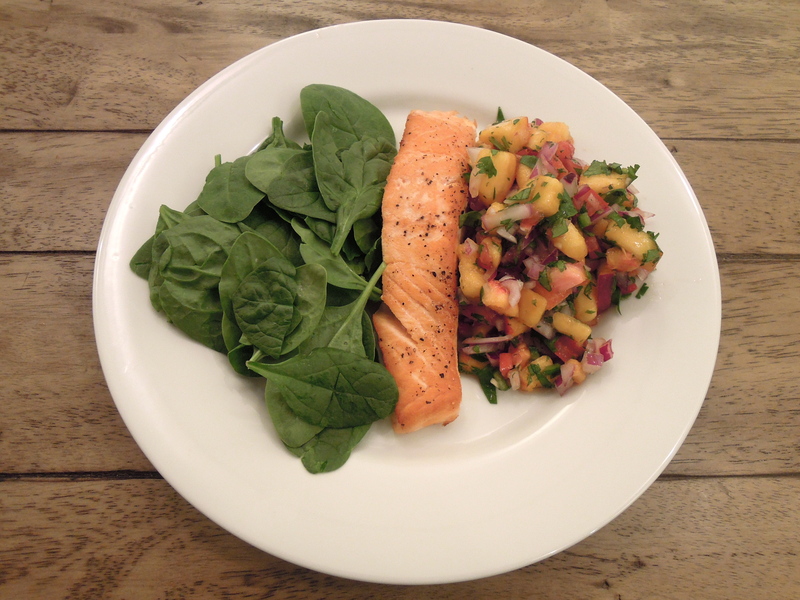 This entry was posted in Fish, Salad, Sides on August 28, 2012 by Paige Greenfield. Wait what was I talking about? Oh yeah, not cooking. Sometimes I’m just not feeling it (especially when it’s 300 degrees outside), but I still want to consume the items in my fridge, eat well, and avoid ordering takeout. That’s how this dinner came to be. I randomly picked up a bag of broccoli slaw at Trader Joe’s earlier this week. (If you’ve never had broccoli slaw it’s just shaved broccoli stalks and shredded carrots. Mega crunch factor.) To me, slaw screams summer and this kind is way tastier than the one made with cabbage. I didn’t have any specific plans for the slaw at the time, but when I saw it in my fridge on an I-don’t-feel-like-cooking day I decided it was the perfect answer. The only effort I put into it was slicing an apple into matchsticks for some sweetness and whipping up a super easy dressing (with Greek yogurt instead of mayo–score!) Then, for protein, I sauteed some shrimp. (Okay, those required a tiny bit of cooking, but I could handle five minutes on the stovetop.) Although I’m still figuring out what it takes to have a perfectly stocked fridge, freezer, and pantry (why do I feel this is going to be a lifelong effort? 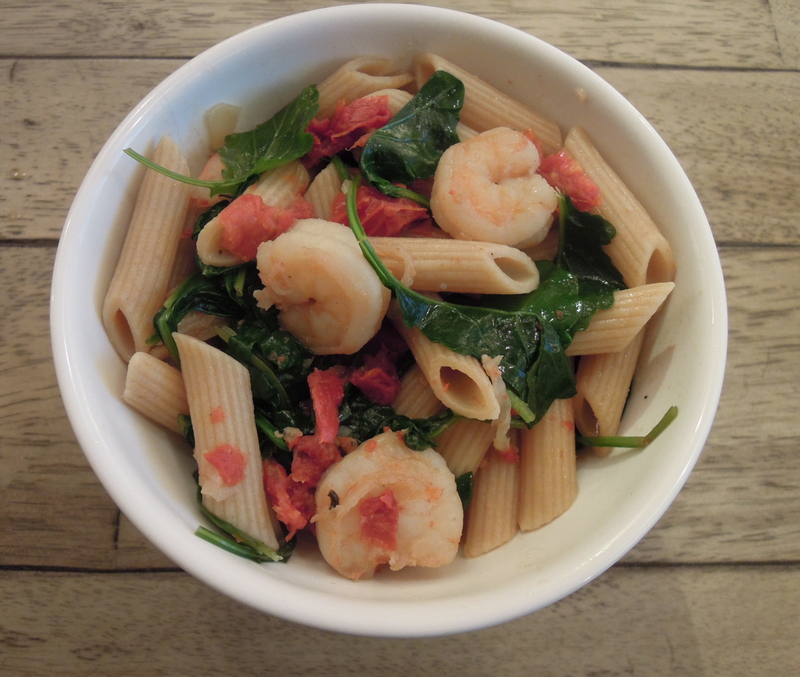 ), frozen shrimp is one thing I always have on hand–it’s ideal for putting together meals in a pinch like this one. I almost didn’t post this recipe because it feels so simple and so easy, but isn’t that what summer is all about? Toss this baby together so you can spend those long summer nights doing whatever you love to do–hanging out at the beach, going for a walk, or watching this ridiculous performance. Again. If shrimp are frozen, defrost in water for 10 minutes. Drain. Place shrimp in a bowl with olive oil, salt, and pepper and toss to coat. Set aside. Place broccoli slaw and apples in a bowl. Combine dressing ingredients in a separate container with a lid. Shake vigorously until combined. Pour all of the dressing on the slaw and toss to coat. Season with additional black pepper and set aside. Heat a small pan on medium heat. 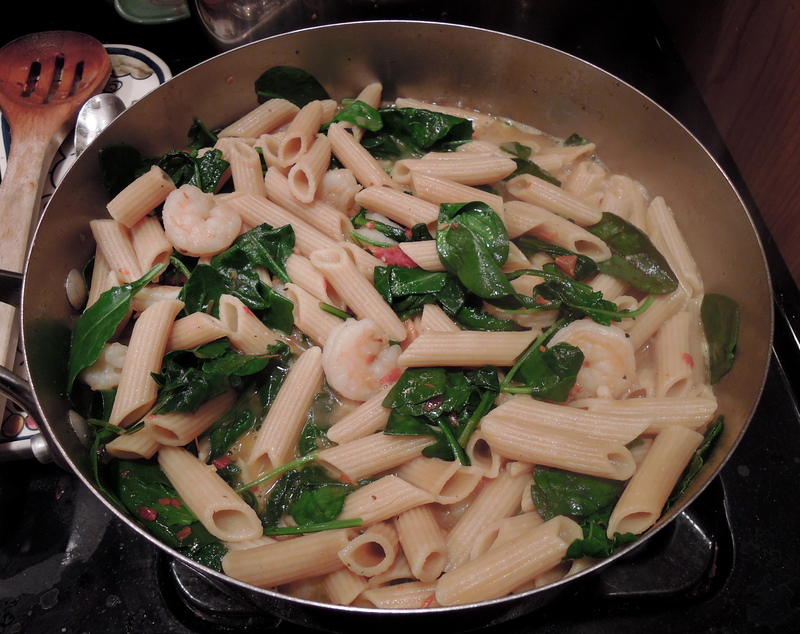 When hot, add shrimp and cook, tossing occasionally, until pink–about five minutes. 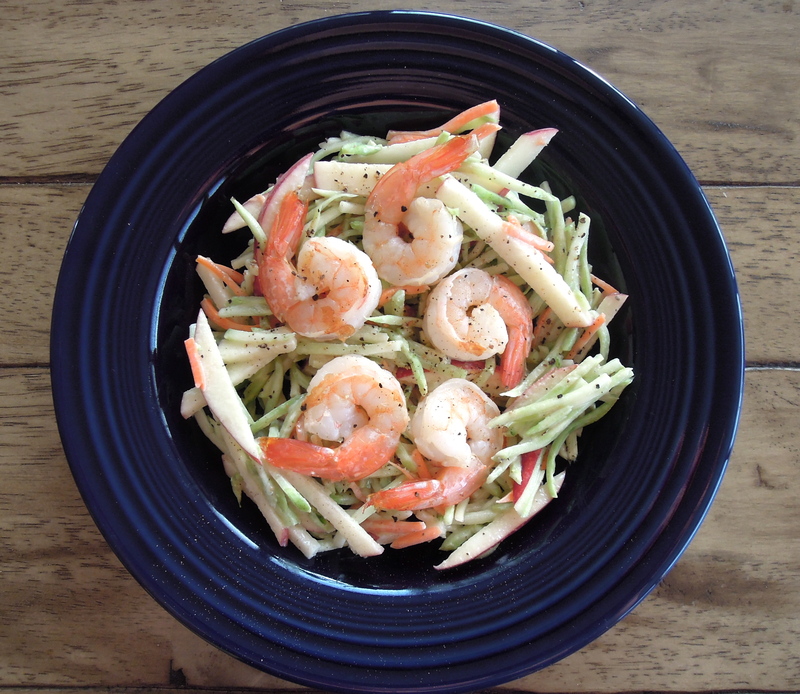 To serve: Fill a bowl with broccoli slaw, top with shrimp, and season with additional salt and pepper to taste. 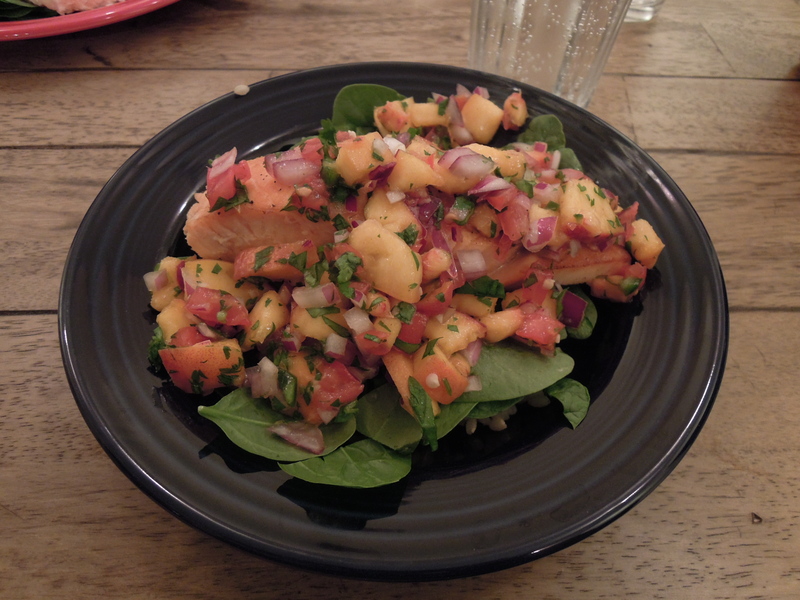 This entry was posted in Fish, Salad on June 29, 2012 by Paige Greenfield.